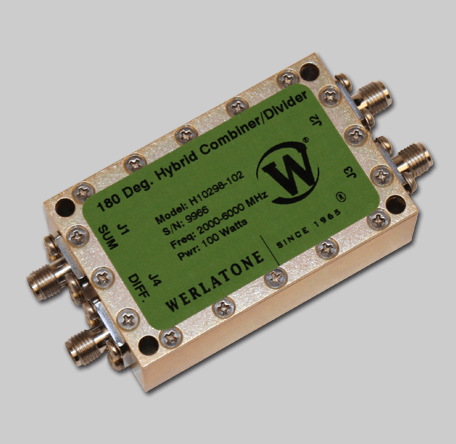 The Model H10298 is a fully connectorized 180° Hybrid covering a full 2 to 6 GHz at 100 W CW. Measuring just 2.4 x 1.5 x 0.75", this unit is ideal for system level combining applications, outside the module. The H10126 performs better than 0.8 dB insertion loss across the entire 2-6 GHz band, and offers better than 20 dB port-to-port isolation. This very compact unit, is designed for military and extreme commercial environmental conditions. The Model H10298 is a fully connectorized 180° Hybrid covering a full 2 to 6 GHz at 100 W CW. Measuring just 2.4 x 1.5 x 0.75″, this unit is ideal for system level combining applications, outside the module. The H10126 performs better than 0.8 dB insertion loss across the entire 2-6 GHz band, and offers better than 20 dB port-to-port isolation. This very compact unit, is designed for military and extreme commercial environmental conditions.